(1) Instead of turning fabric under I cut the strips using a rotary cutter with a wavy blade, which makes assembly faster. Another benefit: once washed the edges will have a soft fray, adding to the cuteness! (2) I chose flannel instead of regular quilting cotton for a softer feel. (3) In order to prevent diaper fabric from bunching under the flannel once burp cloth is washed, I quilted it in different ways, but my preferred (for a quicker project) is a simple line down the middle. 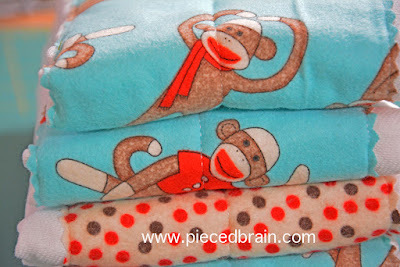 Using the rotary cutter, cut flannel into 4-1/2" x 18" rectangles (I had 1/2 yard of the monkey fabric and half of the dots. It was easy to just lay fabric lengthwise on my cutting mat and cut the 4-1/2" strips. When I needed one more, I got the dots fabric and cut a strip out of it. So, the fabric was already 18" wide.) 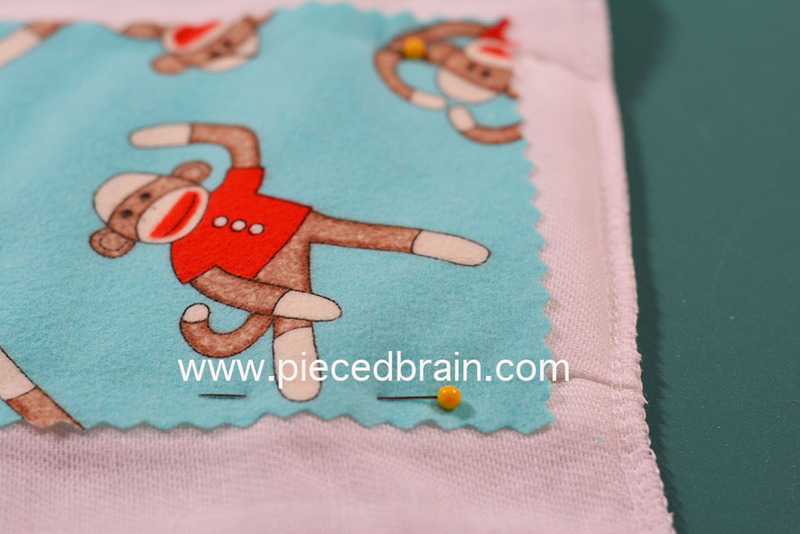 Pin strips onto cloth diaper. Using the walking foot and a quilting needle, stitch a line down the middle of the flannel strip. Notice that there are no marks on the flannel - I eyeballed the middle. 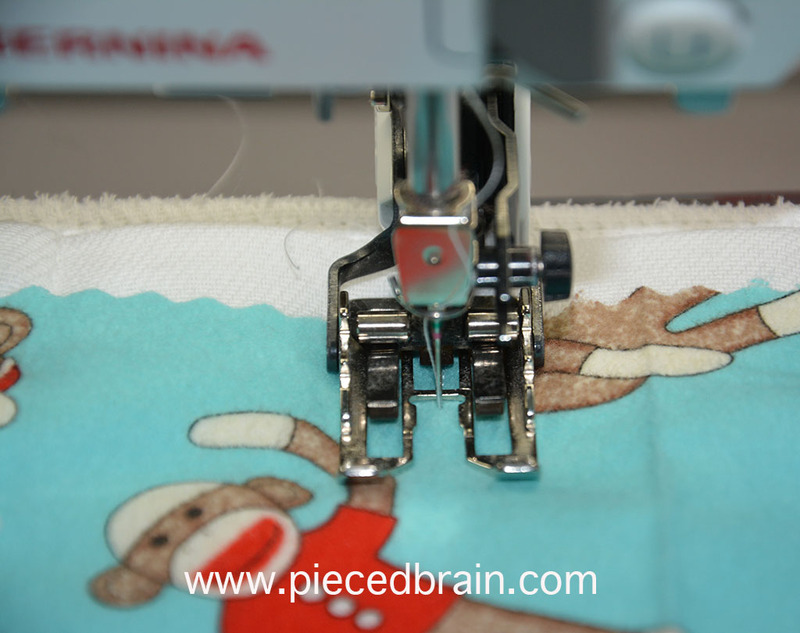 At the end of the strip, pivot foot and stitch all around the strip, ending where you just pivoted. This is all it takes! Repeat with the other 9 diapers, make two stacks of five burp cloths each, tie them with a contrasting bow, and the gift is ready. 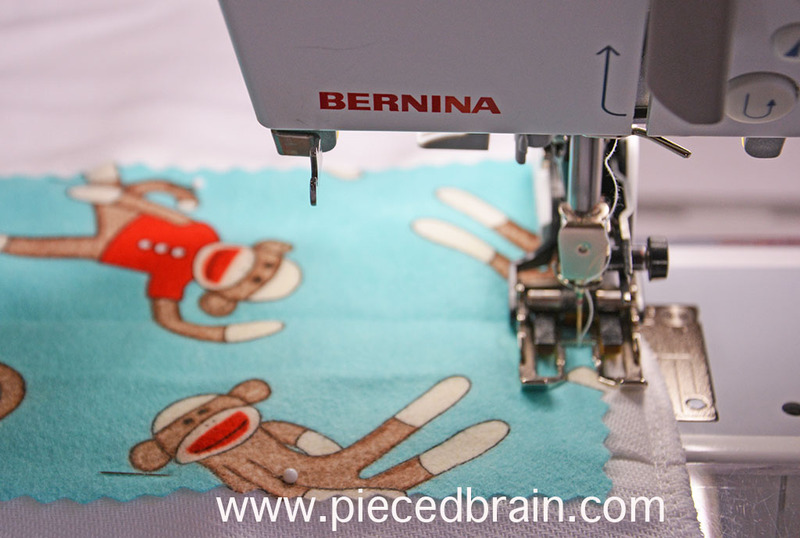 It may have taken longer to prepare this post than it did to prepare the burp cloths. They will be washed many times and, between the gentle fraying of the Moda flannel and the sturdy Aurifil thread, I think they are ready for the task! Enjoy this Monday, and don't forget to enter the Giveaway for Quilt Kit, which ends tomorrow! Hah, a wonderful gift, and so cute! This is a great gift idea. I have a lot of baby flannel I could use up in this manner, and it seems a lote of women I know are having babies. I will have to get started. Thanks for the idea. This is a great gift idea, I have a lot of mothers to be coming up. There's nothing cuter than a sock monkey (well, maybe the baby--haha!). Cute, quick, and clever! Thanks for sharing! The burpcloths are cut but hey, you look too young to have grandchildren! I really like what you did; they are really nice. Does the wavy blade slow down the unraveling of the flannel? I also like the softness of the flannel. I did reply to you, but here it is: the wavy blade won't let the flannel (or cotton for that matter) unravel because of the angle it cuts the fabric (same as happens with Moda charm packs or jelly rolls). However, since the edge is not sewn, it will have a tiny bit of fraying and it will look super cute! Hope this helps! Thank you for the great tutorial. Would you give me a little more information on the Gerber diapers. I've looked online and am almost :,) overwhelmed with all the different types. What is the measurements of the diaper onto which the flannel will be sewn. Just so I understand.....the back is not covered at all? It's just the diaper itself? The back of the diaper? No. The strip of fabric goes on the top and the bottom only shows the stitching. Hope this helps. Let me know! Congrats on the soon to be Grandbaby! We just found out that I am going to be a Great Auntie and boy am I ever excited and sewing up a storm. 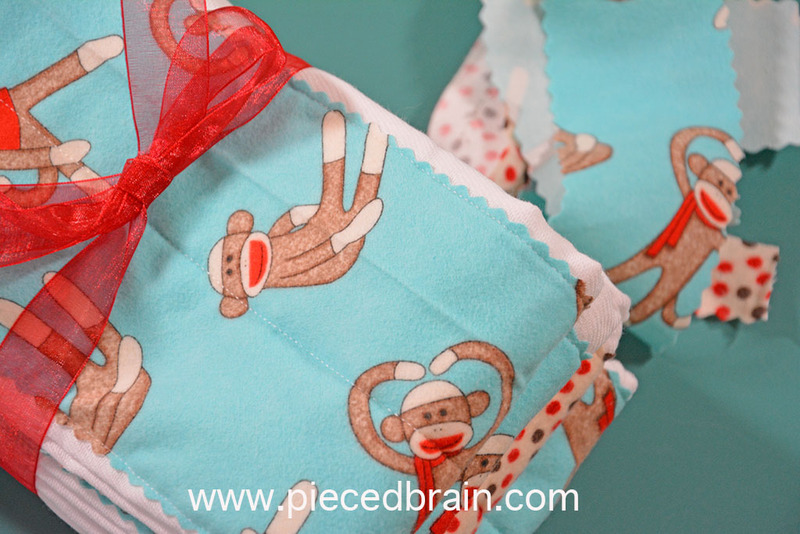 Great idea and tutorial, but I have been looking for cloth diapers for another project and have not been able to find any. My next solution is ordering online if I can find some. So thank you for sharing and for the give away also that I entered. Have a fantastic creative day! love these. Somebody may have asked already, but would pinking shears work too? Yes, pinking shears will also work!